Automatic or Drop-In Toilet cleaners usually consist of a disc of cleaner that you deposit into the toilet tank. Some other models suspend from the toilet tank or rim of the toilet. They automatically dispense cleaning solution into the water when the toilet is flushed. An automatic cleaner is easy to use and easy to maintain. The toilet will still need to be scrubbed occasionally. These cleaners aren't a good idea if you have pets or children who are likely to have access. Powder Toilet cleaners are designed to scrub a toilet without scratching it. These cleaners are a good choice when staining of the toilet bowl is an issue. If you have rust or water deposit stains in your toilet bowl, using a powder cleanser offers enough scrubbing power without scratching your toilet. Be careful not to scratch the surfaces of the toilet, which will allow future staining to occur more easily. Abrasive cleaners also require the use of an additional brush. Toilet brushes are bristle brushes that usually come with a storage container. Many companies market the toilet brushes to match bathroom decor. A good toilet brush with stiff all-plastic brush and bristles does a great job at scrubbing a toilet. Don't choose a brush with bristles attached to wire. This can damage toilets. A toilet brush needs to be thoroughly disinfected and/or kept away from areas where it could cross contaminate with bacteria. Cheap brushes can also damage the toilet. 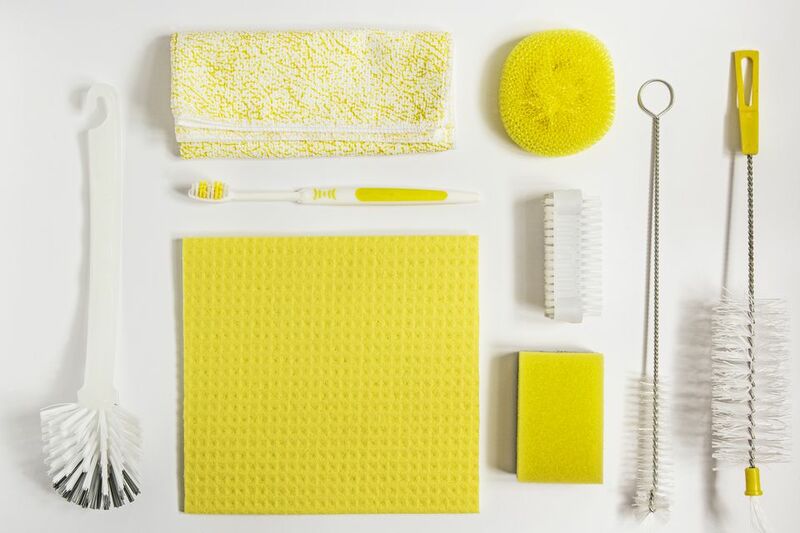 Even the most experienced toilet cleaner can occasionally splash water and or cleaner during a good scrubbing. Protect your eyes with goggles and your hands with gloves. This is one of the filthiest places in your home. You do not want the contents or the cleaner anywhere near your eyes and hands. Almost every cleaning product company has some form of a disposable toilet cleaning system on the market. This systems allow you to have disposable prefilled cleaning heads, or automatic cleanser triggers that keep you from relying on a reusable brush and separate cleanser. These systems save time because there is little cleanup. The cleaning systems work fairly well, although toilets with staining may still need a brush. Disposable cleaners and cloths aren't friends to the environment. Sometimes it seems as though the outside has become dirtier than the bowl. Using paper towels, rags, or sponges along with a spray cleaner will get the outside as gleaming as the bowl. Paper towels are able to be thrown away. There is no risk of contaminating other surfaces or laundry. Paper towels aren't the most environmentally friendly choice for cleaning. Use rags if you prefer, but wash right away in hot water. Otherwise, go with paper towels, and never use sponges.